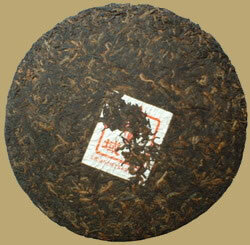 This ripe Pu-erh Chitsu Pingcha was harvested from Menghai county, produced by Kunming Guyi company. The tea gives a deep bright red infusion, very smooth and full in the mouth, swallows extremely well. Perfectly fine to drink as it is, and it will be excellent for the next 10 years.